This hike begins along Forest Road 5270 at about 2400' elevation. Within the first 2.5 miles you gain nearly 3000'. To say the least, this trail is a bit steep. It is so steep that they have put steps on the trail in a couple of places. Having said that, don't get me wrong. This hike is so worth it! Just take your time so when you reach the top you can enjoy the unbelievable views. 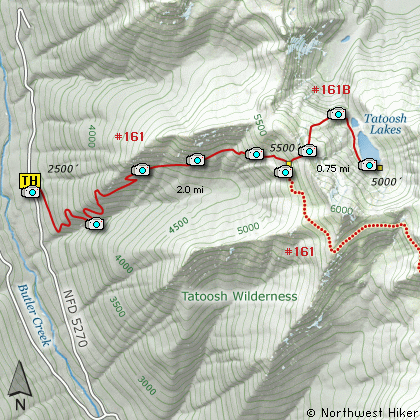 At 3 miles you come to the junction of Trail #161B which takes you further uphill to a saddle in the Tatoosh Ridge, then down about 500' elevation to the Tatoosh Lakes. In season you will be drowned in wildflowers. There is more beauty here than the eye can behold. Enjoy! 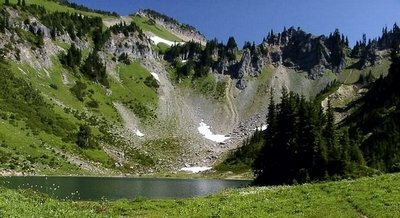 The first Tatoosh Lake is rather small, but the second lake is fairly large. They are both beautiful and provide such a wonderful place to enjoy solitude. I say solitude because chances are you may be the only person there due to the difficulty of getting there. Travel east on US Hwy 12 for about 64 miles to Packwood. As you continue eastbound on US Hwy 12 through Packwood, near the east end of the town, you will come to the junction of Forest Road 52 on your left. Follow FR52 west across the Cowlitz River, and uphill out of the valley for about 4.1 miles. You will then come to the junction with Forest Road 5270 on your right. Bear right and follow FR5270 for about 5.6 miles where it is just about to cross Butter Creek. Bear right onto Forest Road 5272 and follow this road for about 1.4 miles and you will find the trailhead for both Tatoosh Wilderness hikes on your right.